EMPIRE OF THE WOLF graphic novel premieres! 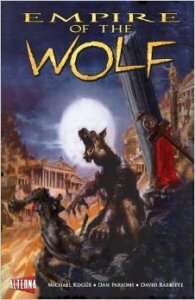 Alterna Comics has just published the graphic novel compilation of the four issue series, Empire of the Wolf. It can be found or ordered from local comic shops, bookstores, and Barnes & Noble. It’s also available for purchase online at amazon and comiXology.